SIPs use their plastic foam core as structure as well as insulation. PorterSIPs use one pound density expanded polystyrene (EPS) foam plastic as the core. EPS foam plastic provides top-performing structure and insulation for this building component. The insulating core of a structural insulated panel provides continuous insulation. SIPs enable structures to be assembled with minimal in-field framing. The percentage of area in a wall assembly composed of sawn lumber is classified as a wall’s “framing factor.” The framing factor is a measure of thermal bridging. The more framing, the higher the framing factor and the more energy is lost due to thermal bridging. A typical stick-framed home averages a framing factor ranging from 15 to 25 percent, while a SIP home averages a framing factor of only 3 percent. When the whole-wall R-value is measured, SIP walls outperform stick-framed walls where studs placed 16 or 24 inches on center cause thermal bridging and result in energy loss. Additionally, fiberglass and other insulating materials used in stick-framing are subject to gaps, voids, or compression, causing further degradation in thermal performance and drafts. Building with jumbo SIPs results in fewer joints and is an easy way to build a very air-tight structure. Studies at the U.S. Department of Energy’s (DOE) Oak Ridge National Laboratory (ORNL) have shown a SIP room to have 90 percent less air leakage than its stick-framed counterpart. Follow this link to see the full report. Air leakage in homes is measured by using a blower door test. Using a specially designed fan to negatively pressurize the structure, Home Energy Rating System (HERS) technicians can measure the amount of air leakage in the home and use this information to size HVAC equipment or apply for an ENERGY STAR qualification. SIP-research homes built by ORNL were measured to have infiltration rates as low as 0.03 natural air changes per hour (ACH). Stick-framed homes of similar size in the same subdivision averaged blower door test results ranging from 0.20 to 0.25. SIP homes have proven to reach these levels of air tightness consistently enough for the EPA to waive the required blower door test for homes with a complete SIP envelope to receive an ENERGY STAR rating. When combined with other high-performance systems, SIP homes can reduce annual energy use by up to 50 percent or more. SIPs have been instrumental in the creation of many zero-energy buildings that produce as much energy as they consume through solar photovoltaic cells and a high performance SIP building envelope. In 2002, ORNL teamed up with the Structural Insulated Panel Association (SIPA) and the DOE to create five innovative net-zero energy buildings. These high-performance homes featured structural insulated panel walls and roofs, roof-top solar photovoltaic systems, and other energy efficient technologies that helped the homes approach DOE’s goal of net-zero energy use. These 5 case-studies (See chart) are single-family homes that were built in Habitat for Humanity’s Harmony Heights subdivision in Lenoir, Tennessee. ORNL performed extensive testing on the performance of these homes and monitored energy usage for the first year of habitation. The air tightness and insulating properties of a SIP building envelope helped cut the annual heating and cooling cost for the first zero-energy home to $0.45 a day. By using SIPs in conjunction with other energy-efficient and affordable features, builders are able to offer low energy homes to North American home buyers. The importance of saving energy in building construction cannot be over stated: today’s efforts at reducing pollution, dependence on foreign oil, and global warming are almost completely dedicated to the generation side of the issue. 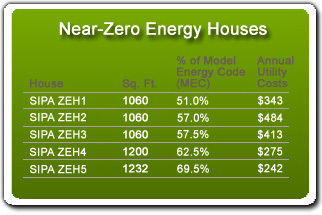 It is a well documented that it is cheaper and easier to conserve energy than it is to generate new energy. Today in the U.S., residential structures use 21% and commercial structures use 17% of the total energy produced. Heating and cooling energy represent the biggest single factors. Reducing the demand for heating and cooling in residential and commercial buildings by approximately 50% is a simple process and the cost is far less than the cost of generating this amount of energy. 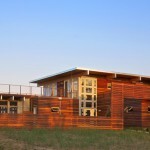 SIPs use materials that make minimal environmental impact. By weight, PorterSIPs use approximately 89% engineered wood (OSB), 10% EPS foam plastic and less than 1% water activated polyurethane adhesive. OSB comes from small, fast-growing trees (typically aspen) that that are underutilized or are species grown in managed forests. Using the small, fast-growing trees helps to preserve our beautiful old forests. Also, typical exterior SIP walls use only approximately 12-20% of the dimensional lumber when compared to stick-built construction. OSB, which is an engineered wood-product, is a renewable, recyclable, biodegradable resource that is easily manufactured in large sheets. Engineered woods like OSB make the best use of forests and have been found to be better for the environment than fiberglass, steel or concrete in terms of energy, emissions and waste. EPS foam plastic is an example of refining petroleum to make something more useful and permanent than fuel. Both EPS and gasoline are made of carbon and hydrogen that come from crude oil. It is known that burning petroleum as a fuel contributes to global warming. Using EPS as insulation reduces the demand for fuel – a much better use of this raw material. Also, the amount of petroleum used to make EPS is relatively small. For example, a SIP measuring 8’x 24’x 6 ½” thick will use about 90 pounds of plastic and this is equivalent to only about 14.5 gallons of gasoline. The amount of energy required to produce EPS foam plastic is much less than that required for fiberglass batting. According to the EPS Molders Association, the energy required to produce EPS is 24 percent less than the energy used to produce equivalent R-value fiberglass insulation. The adhesive used in bonding the OSB skins of the panel to the EPS core is water activated, contains no solvents and emits no VOCs during curing.